In this paper, a new cryptographic algorithm was created with the soft sets, symmetric groups, soft matrices representing soft sets, and AES. In 1999, by Molodtsov proposed soft set theory as a new mathematical tool to deal with uncertainties. This theory which has been applied to many fields which contain uncertainties received much attention since proposed. The inverse product and characteristic product defined on soft matrices was used in soft encryption and soft decryption. In order to make the encryption more secure, symmetric groups included in the algorithm. Bu çalışmada, esnek kümeler, esnek kümeleri temsil eden esnek matrisler, simetrik gruplar ve AES ile yeni bir şifreleme algoritması oluşturulmuştur.1999’da Molodtsov tarafından esnek küme teorisi belirsizlikleri ortadan kaldırabilmek için yeni bir matematiksel yöntem olarak kullanılmaya başlandı. Belirsizlikleri içeren birçok alana uygulan bu teori önerildiğinden bu yana çok dikkat çekmiştir. Esnek matrisler üzerinde tanımlanan invers çarpım ve karakteristik çarpım esnek şifrelemede ve esnek deşifrelemede kullanılmıştır. 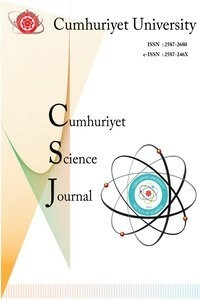 Şifrelemenin daha güvenli olması için simetrik gruplar algoritmaya dahil edilmiştir.
.	Molodtsov, D., Soft set theory-first results, Computers and Mathematics with Applications, 37, (1999), 19–31.
.	Molodtsov, D. , The Theory of Soft Sets, URRS Puplishers. , Moscow, (in Russian) 2004.
.	Rivest, R. , Adleman, L. and Dertouzos, M., On data banks and privacy homomorphisms, In Foundations of Secure Computation, 169–180. 1978.
.	Roy, A.R. and Maji, P.K., A fuzzy soft set theoretic approach to decision making problem, Journal of Computational and Applied Mathematics , 203, (2007), 412–418.
.	Feng, F. , Jun, Y. B. and Zhao X., Soft semirings, Computers and Mathematics with Applications, 56,( 2008), 2621–2628.
.	Sezgin, A. and Atagün, A.O., On operations of soft sets, Computers and Mathematics with Applications, 61, (2011), 1457–1467.
.	Aktas H., Çagman N., Soft sets and soft groups, Inform. Sci. , 177, (2007),2726-2735.
.	Atagün, A.O. and Sezgin, A., Soft substructures of rings, fields and modules, Comput. Math. Appl., 61 (3), (2011), 592-601.
.	Sezgin, A .Atagün, O. and Aygün, E., A note on soft near-rings and idealistic soft near-rings, Filomat, , Vol. 25, (1), (2011), 53–68.
.	Atagün, A.O. and Aygün, E., Groups of soft sets, Journal of Intelligent and Fuzzy Sys., 30, (2016),729-733.
.	Miller, F.P., Vandome, A.V. , McBrewster, J., Advanced Encryption Standard, Alpha Press, London, 243s. 2009.
.	Maji, P.K., Biswas , R. and Roy, A.R., Soft set theory. Computers & Mathematics with Applications, 45,( 2003), 555-562.
.	Daeman, J., Rijmen, V. The design of Rijndael: AES: the Advanced Encryption Standard.Berlin Heidelberg: Springer-Verlag128s, 2002.
.	Çağman, N. and Enginoğlu S., Soft matrix theory and its decions making, Computers and Mathemetics with Applications, 59,( 2010), 3308-3314.
.	Stinson, D., Cyrptography: Theory and Practice , CRC Press, New Jersey 573s. 1995.